Bold And The Beautiful Spoilers: Will Flo Reveal Baby Secret When She Finds Out Hope Is Family? 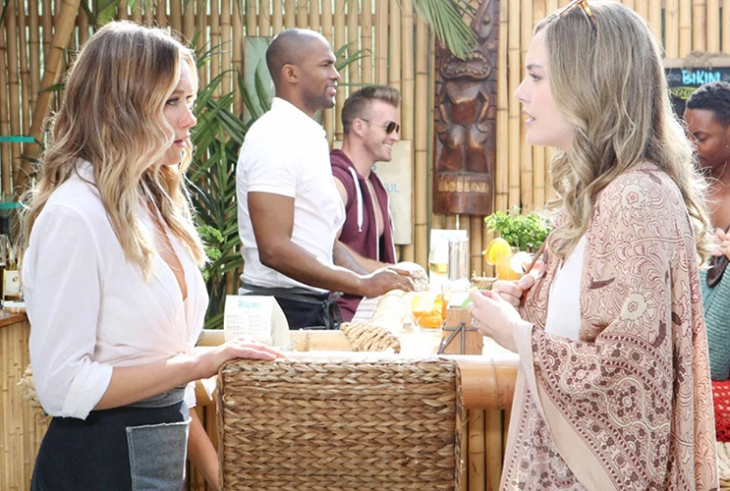 The Bold and the Beautiful (B&B) spoilers tease that Flo Fulton (Katrina Bowden) will be forced to admit the baby truth soon. She will learn her father was Storm Logan (William deVry). Storm was Katie (Heather Tom), Brooke (Katherine Kelly Lang), and Donna Logan’s (Jennifer Gareis) brother. Keeping the truth from her cousin will prove to be very difficult for Flo. Here’s what you need to know about what’s ahead. After initially believing that Bill Spencer (Don Diamont) could be Flo’s daddy, she will find out her father was Storm. But she will not be able to meet him, as he died more than 10 years ago. B&B spoilers say that Katie will tearfully explain how he died so she could live – he gave her his heart (literally). Flo will be moved by their love for her biological father. She will say she wished she could have met him. Shauna Fulton (Denise Richards) will recall her time with Storm and will note that she remembers him fondly. All the women will agree that he was a wonderful man. After Hope Spencer (Annika Noelle) discovers Flo is her cousin, she will want to get to know her better. Under normal circumstances, that would be a great thing. However, because Flo was part of the baby switching scheme that left Hope childless, it will bring her a lot of guilt. Will Flo Reveal Baby Secret When She Finds Out Hope Is Family? Bold And The Beautiful Spoilers – When Will Flo Fulton Confess The Truth? B&B spoilers state that Flo will be forced to confess to her cousin, at some point. She will not be able to keep up the charade of being Phoebe’s birth mother. She will be touched by the Logans acceptance of her and she will let Hope know her baby is still alive. The big question mark in the storyline is how long it will take Flo to confess the baby truth to her new family. It could take a few days or it could take months. Soap fans, do you want Flo to tell Hope the truth about Beth? Don’t forget to come back later for more The Bold and the Beautiful (B&B) spoilers, news, and casting updates!